I was told that this book was a diverting, amusing, pleasurable read. I was a little dubious as I has forayed a little into sequels and retelling's of Pride and Prejudice. Some of them were so woefully told that I never bothered to get past the first chapter. This book surprised me quiet nicely. I really enjoyed reading about the events of Pride and Prejudice. 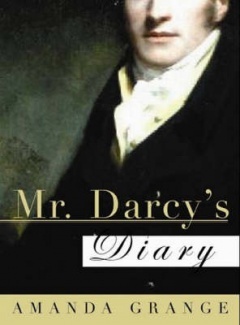 I had always longed for Austen to give us more from Darcy's point of view. This book satisfied that longing. It took me a chapter or two to get into it, but once that was over I was racing through the book, eager to see how it ends (truly funny as I know exactly how it ends). Grange does a very good job of bringing us into Darcy's inner thoughts. I enjoyed the way she showed us his relationship with his sister Georgiana, his friendship with Bingley. I was so amused by Mrs Philips and Mrs Bennet's behaviour towards him once he and Lizzie were acknowledged in their engagement. I found it hard to believe though that a man would record all these events in such detail, right down to entire conversations. However, I know that it was needed for the book and I simply enjoyed proceedings too much to let it really affect my feelings on this book.